View of Peterhouse Chapel and the new building in the entrance court. Peterhouse was the first part of the university to be established. In 1280 the Bishop of Ely, Hugh de Balsham, established a group of scholars in Cambridge. They moved to hostels by St Peter's Church (now St Mary the Less Church) in 1284. The college buildings were started in 1286. 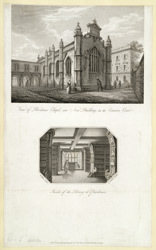 What can be seen in this print is the chapel, built 1628-32 and a new 18th century building block, designed by Mr Burrough of Caius College in the Italian style. The second print is inside the Library at Peterhouse, which was completed in 1595.